Quick question I’ve always wondered about. I’m recently self taught and still learning the nuances of letterpress. 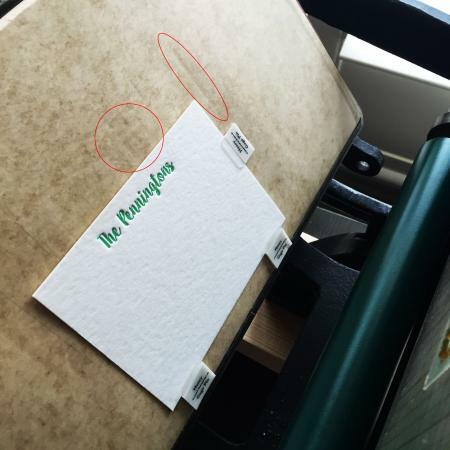 I have C&P 6x10 and have been successfully printing for the last 2 years, but I’ve always wondered about something. Since I have a tabletop press, I keep my artwork small and simple. Sometimes I notice on small jobs (like names for stationery cards) the impression is deeper and I can see it on the tympan and on a piece of red press board. Normally, when I see that, I remove some of the packing. I use the same tympan top sheet for multiple jobs. Wondering if a piece of tympan with a lot of impressions from old jobs could mess with the printing a new project? I don’t have anyone around to ask and this community hasn’t let me down. I’ve attached an image that shows some of the impressions on the tympan. The answer to your question is Maybe. Your printed piece shows deep impression. I assume that is what you want. Your packing should be hard packing with the pressboard just under the tympan sheet. 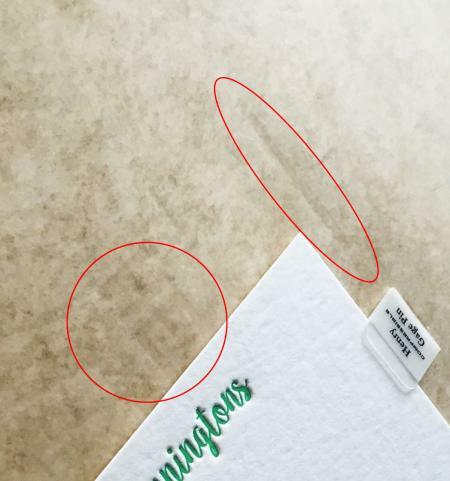 You may use the same tympan sheet for additional jobs until you notice that any impression in the sheet is adversely affecting the printing. Turn it and move it to find a fresh spot. I manage impression by observing the back of the sheet as much as the front. ink is probably more flexible than foil, so if it not a problem then answer is no, it is not a problem. if it is a problem then yes, it is a problem. this may sound stupidly simplified, but it is pretty much true. if there seems to be a problem, and you can see an errant variance in pressure on the back, replace with a new tympan, ( I always assume any new stock will add pressure over a used one), adjusting for the new pressure, and see if it’s fixed. Thanks for the feedback! I knew it was a pretty common sense type question, just didn’t have anyone to ask. I know there are so many nuances with every step of the printing process. I normally do move my image around so it’s not overlapping a previously impressed spot. Just didn’t know if it was a bad practice to have much impression on the tympan (meaning I need to work on my packing skills/move the platen back). The impression in the top sheet will most likely cause no problem, but a dent in the pressboard can. Inky’s comment is a good one. Hard packing is the best to give you the best and most crisp impression. Anytime you are sinking into the packing, you are probably not getting the best actual impression in the paper. As a second note, I probably would have rotated the image on the plate so the sheet did not have to be fed so far down on the platen. On the Pilot you have it is not such an issue, since it is hand-operated, but on a motorized press, it is best not to have to feed so far down on the platen. Those great feed guides you are using will not damage the mounting plate, no matter where they are placed, and you can do a better job of moving the sheet into register if placed a bit higher on the platen. Thanks, John. Not sure why I positioned it so far down on the platen. Maybe from a previous job, but good info about it being easier to feed closer to the top. Right now for packing I have 3 pieces of red pressboard and a few sheets of copy paper. After reading a couple other posts, I might need to move my platen back a bit to use less packing. on most presses, you want to try to center the impression, as it seems you have here, not the sheet. Unless you really know what you are doing in attempting to adjust the platen, consider not doing it. If the platen is parallel to the bed (often called square), it may be best to leave it alone and make adjustments with the packing and not the platen bolts. When the press was adjusted and left the factory, it was adjusted to require about .050” packing. That works out to be about one sheet of red pressboard, two sheets of copy paper and a tympan sheet. The larger the form, the more packing is required. Just replace the tympan and packing whenever you have a deep impression. Note to all you out there that tympan paper alternative that works well, and cheaper is 100# gloss text stock. It is also easier to get from your local paper house or a near by printing shop. Just have them cut it to the same size you use for your typmans.